In case you haven’t seen or used it, there is a “Bulk Actions link” just under the “Add Monitor button” in the left sidebar. 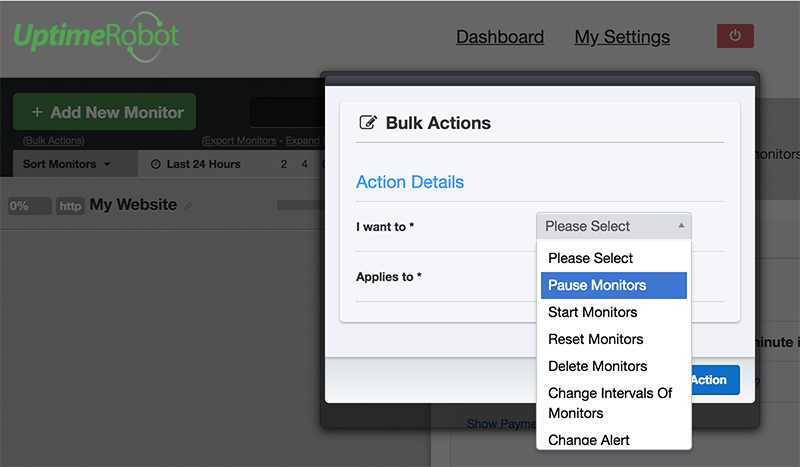 It simply opens the “Bulk Actions dialog” and presents a set of actions that can be applied to monitors in bulk. Hope that they will help and we are already working on the expected addition.. which is “bulk importing monitors” :). This entry was posted in Announcements and tagged Bulk Actions on July 24, 2018 by Umut Muhaddisoglu. Wanna check the previous (← New Feature – Telegram Integration) and next (→ New Feature – Microsoft Teams Integration) posts? Great feature, much appreciated!! Thanks! Thanks, but is there a bulk action to import monitors from a CSV file? I’m setting up a new account and that would be very convenient. Thanks.